Since its creation in 2003, Green Cameroon has worked with communities, schools and other entities to practically carry out and promote nature conservation practices, both at national and international level. The series of projects carried out give us an out-standing track record which we are very proud of. Green Cameroon won its first award in 2007 for its work on using ICTs as a solution to environmental problems under the project “Green Technology“. 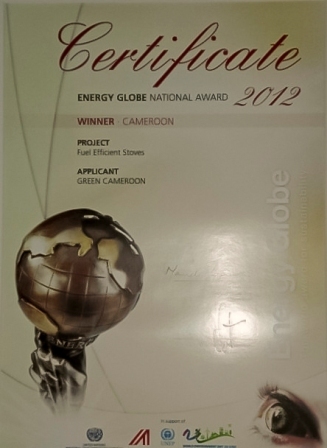 After a lot of successful environmental projects, we also won the National Energy Globe Award for Sustainability 2012 for our Fuel Efficient Stoves project which involves the building of forest saving stoves for community members of the Mount Cameroon Forest Region. Green Cameroon also initiated and championed the creation of a UN Regional Centre of Expertise on Education for Sustainable Development under the name “RCE Buea”. This centre was formally acknowledged and accredited in December Z012. Green Cameroon’s Executive Director, Masango Sone, is also currently the Director and Board Chair of RCE Buea. Past and current projects such as Green Technology, School Environmental Clubs, Community Trees Campaign, Climate Change Campaign, Green Schools, Community Access to portable water, Save Mount Cameroon and Village Community Development have had a lot of positive impact in communities that all go to the glory of Green Cameroon’s partnership with communities. Since 2006, Green Cameroon has joined the international community to fight against climate change through the organization of demonstrations, talks, practical projects and other public events. We have made it our duty to inform citizens on the most pertinent issues affecting their existence. At the top of this list is climate change and its effects in our communities. Our approach is to build capacity of community members on resilience techniques, introduction of alternative sources of livelihoods and encourage active citizenship in the development of counter initiatives. We encourage the use of efficient and renewable energy technologies. In 2012, Green Cameroon was one of the organizations that sat to deliberate on Cameroon’s recommendations to the UN Climate Talks. As a small environmental NGO, Green Cameroon depends largely on volunteers for the execution and success of its projects. We encourage all our volunteers to take initiative, propose suggestions and to share their vision so we keep on growing as a professional NGO. Would you like to contribute to the conservation of our beautiful nature? Do you feel like joining a dynamic local environmental NGO? Discover our Job Opportunities for Volunteers!